Owner, Irina Nicoletti, and acclaimed Russian-American artist, Alexander Kaletski, are getting ready to celebrate the opening of the Claryville Art Center this July. The opening exhibition is being done in conjunction with the Anna Zorina Gallery in Chelsea, New York, and will feature a Kaletski Retrospective: “Forty Years in America.” View the Exhibit and then try Irina’s “Taste of Russia” specials or have a traditional home cooked meal at the Blue Hill Café. FAR OUT FUN IN ANY SEASON! 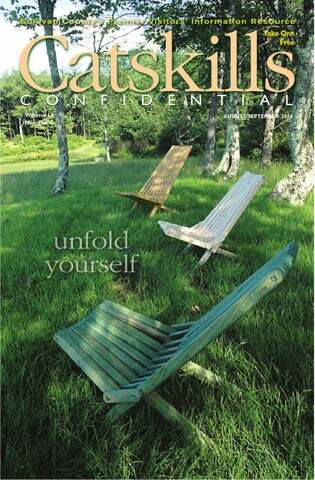 There’s so much to enjoy in our Sullivan County Catskills any time, all year long. Help mark the 45th anniversary of the Woodstock Festival with song and celebration. Come see the site and visit The Museum at Bethel Woods. We’ll greet you with a warm country welcome! 1-800-882-CATS scva.net ® I LOVE NEW YORK logo is a registered trademark/service mark of the NYS Dept. of Economic Development, used with permission. The warm, inviting interior of the Millbrook Inn in Pond Eddy features a fascinating collection of memorabilia, much of it about the Inn (below), the D&H Canal and Route 97. Take in the rays of the setting sun in the aptly-named Sun Room (left), where you’ll also discover glass bottles and insulators from the region (bottom right). Then step into the period setting of the dining room (below), or enjoy the view from The Arnold’s landscaped front porch (bottom left). igh atop Shandelee Mountain, The Arnold House invites you to savor all that makes the Catskills special: Unbroken views of unspoiled nature. Locally-sourced food and drink, prepared creatively and memorably. Rooms that have relaxed visitors for generations. And a friendly crew who feel as much like family as hosts. Every part of The Arnold prompts a closer look, from the inspired lampshades by Light Touch (left) to the spiral staircase (right) leading from the tavern to the dining room and kitchen. Dinner can be served indoors or out, including in the sun room and on the deck (below left). The barn in the backyard (below right) is a perfect spot to hear talented local singers and musicians. looking to appreciate the weathered wood’s old-fashioned charm. Next door is the spa, where licensed professionals Kevin and Joy Oriol knead away worries, lead yoga classes or delicately apply acupuncture. And then there’s the backyard – a vegetable garden at one end (you’re welcome to help them harvest), a pond and benches at the other. So come ... discover for yourself why people are calling The Arnold “the perfect weekend getaway!” Simple comforts are what The Arnold is all about. Nowhere is that better illustrated than in one of the nine bedrooms. WAKE UP ON THE SECOND FLOOR OR THE SECOND GREEN. Complete Play & Stay packages start at just $525! Includes Unlimited Golf with Cart, Complete Breakfast, Lunch and Dinner, and your accommodations! Your choice of 31 spacious rooms or a suite at The Hancock House Hotel in downtown Hancock, NY. Free internet & cable TV! Restaurant & bar on premise. Or choose one of 13 private cabins located throughout the course or on a mountaintop overlooking the village of Hancock and the Delaware River. If you need a 2-day getaway or a 2-week vacation you won’t be disappointed at any Bass Property. Frank and Irina Nicoletti (below) have a vision for Claryville, NY, where they’ve not only made their home but created Claryville Center, featuring a restaurant, grocery, spirits shop, lodging, and now the Claryville Arts Center (bottom). Coming soon: an enormous craft brewery and equally large event hall, all situated next to the Neversink River in the midst of the Catskill Mountains. Stay a day, a week, a month or more in the Claryville Center’s renovated 1890s farmhouse, offering three floors of space and room for two families (below and at right), including a full kitchen and laundry. Next door is the Claryville Arts Center, displaying the work of noted artist Alexander Kaletski (below right). from pine trees harvested from his own property.) Frank and Irina admit that they have quite a bit to tend after when before they could just come to relax at their home. “I enjoy the development,” Frank admits as Irina shakes her head in affectionate resignation. “But often I am glad to get back to my 'day job' sitting at my desk running my law firm in NYC.” The goal is to make Claryville Center a true attraction for locals, people from the surrounding areas and, most importantly, day travelers, and weekend travelers from the New York metropolitan area. “We will finally have a ‘destination site!’” promises Frank. THE RECEPTION Newly redesigned reception room with vast windows & exquisite views. Personalized and customized menus for every budget. Catering to only one reception at a time. Luxurious hotel rooms and complimentary bridal suite. Spa, hair studio and makeup artist on property. Lounge & entertainment areas available. info, call 210-4303. Live Music: Windy Mule at Callicoon Brewing Company, at 6 p.m. For info, call 887-5500. Sunday, August 17 Bagel Festival, Broadway Monticello, 9 a.m. to 4 p.m. For an updated schedule, visit www.thebagelfestival.org. “A Lotta Ricotta” workshop at Apple Pond Farm, in Callicoon Center, from 10:30 to 12:30 p.m. Meet the goats. Try to milk one. Make whole milk ricotta. Learn ways to serve it. Sample local artisan cheeses. Private classes available upon request. Reservations required. Cost is $40 per person. For info, call 482-4764 or visit www.applepondfarm.com. Callicoon Farmers’ Market, 11 a.m. to 2 p.m., Callicoon Creek Park. A collection of locally produced goods…fresh fruit and vegetables, beef, chicken, pork, lamb, veal, goat, trout, eggs, milk, yogurt, cheese, fresh baked bread, baked goods, jams and jellies, maple products, honey, prepared foods, pasta, wine, hard cider, coffee, tea, potted plants, fresh cut flowers, skincare products, artisan wares and much more! Every Sunday until November 16. 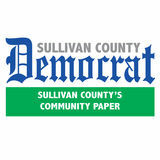 For info, call 866-270-2015 or visit www.sullivancounty farmersmarkets.org. Jazz Brunch at the Dancing Cat Saloon, in Bethel, from 10 a.m. to 1 p.m., Barry Scheinfeld Guitar /Don Miller Bass jazz duo – a sure to be favorite on a Sunday! Every Sunday through December. For info, call 583-3141 or visit www.dancingcatsaloon.com. “Guys and Dolls,” at the Rivoli Theatre, in South Fallsburg, at 2 p.m.
teresting methods of cultivating the land by hand and with our animals! We pride ourselves on our petroleum-free farming practices! Fri, Sat & Sun at 3 and 4 p.m. Continues until November. For info, call 292-9126 or www.rootn roost.com. Live Music Fridays, at 7:30 p.m., at the Dead End Café, in Parksville. Enjoy live jazz, blues, country and folk music every Friday. Dinner and refreshments will be served prior to each performance. Please arrive 45 minutes early to be seated and to place your orders. Credit cards welcome! Continues every Friday, until August 29. For info, call 292-0400 or visit www.parksvilleusa.com. Saturday, September 6 Tree Identification Field Day, at Delaware Highlands Conservancy, at 10 a.m., in Kauneonga Lake. Join the Conservancy for a walk on woodland trails on its 119 acre protected property. Attendees will learn how to identify common trees and forest plants in the Upper Delaware Region and about the Conservancy’s plans for expanding outdoor education opportunities on the property. In addition, learn about the property’s conservation easement that protects this piece of farm and woodland from development and subdivision. The program is free but prior registration is required. For info, call (570) 226-3164 or visit delawarehighlands.org. wine, hard cider, coffee, tea, potted plants, fresh cut flowers, skincare products, artisan wares and much more! Every Sunday until November 16. For info, call 866-270-2015 or visit www.sullivancounty farmersmarkets.org. Jazz Brunch at the Dancing Cat Saloon, in Bethel, from 10 a.m. to 1 p.m., Barry Scheinfeld Guitar /Don Miller Bass jazz duo – a sure to be favorite on a Sunday! Every Sunday through December. For info, call 583-3141 or visit www.dancingcatsaloon.com. Farmers Market: Niforatos Field in Roscoe, from 10 a.m. to 2 p.m. All the vegetables, pasta, cheeses, eggs, baked goods, wares are all grown or made in USA! Every Sunday until October 12. Harvest Festival: Music & Arts Fair, 11 a.m. to 4 p.m., at Bethel Woods Market Sheds, Bethel. Free entry, $2 parking. he festival will present music and poster art from the 1960s to present! Come and enjoy the Poster Marketplace where collectors, vendors and enthusiasts alike can convene at our historic location to celebrate the iconic art forms of posters and prints. The festival features a farmers market, craft village, live performances, corn and hay mazes, pony rides and more. Each week offers a new theme or special event sure to please the entire family. For info, call 583-2000 or 800-745-3000, or visit www. bethelwoodscenter.org. Fire Department ballfield. The “Germania Almraush Schuplatter Verein” will be on hand to entertain with traditional German dancing! German and domestic beer will be sold along with an assortment of German foods! This year we will also feature a terrific band from Buffalo, NY, “The Frankfurters”. Cost is $5 at the door, kids under 12 are free. For info, call 516-885-1021 or visit http://vonsteubenday.yulanfd.com. Farmstock: Working Farm Tour - Majestic Farm, Mountaindale; noon to 3 p.m. Heritage pigs and pastureraised sheep and chickens. Cost is $6 for adults, $4 for kids under 12, and 5 and under are free. For info, call 917-566-6120 or visit sullivancountyfarm network.org. Around Neversink, at Time and the Valleys Museum, in Grahamsville, from 2 to 4 p.m. Author and Neversink Town Historian Carol Smythe will give an illustrated lecture on her new book: “Around Neversink: From the Rondout Reservoir to the Neversink Reservoir”. Published by the Arcadia Publishing Company, the book is one of their Images of America series. Copies of the book will be available for sale during the program and through the Museum Shop. Refreshments are included. For info, call 985-7700 or visit www.timeandthevalleys museum.org. Cafe Risque Drag and Fashion Show, at Forestburgh Playhouse, at 7 p.m. Doors open at 7:00pm Tickets in advance or at the door. For information and ticket prices, call 794-1194. Event Gallery: Tom Chapin at Bethel Woods Center for the Arts, at 8 p.m. In a career that spans 5 decades, 23 albums, and 3 Grammy awards, multitalented singer-songwriter-guitarist Tom Chapin has covered an incredible amount of creative ground. In addition to his work as a recording artist and concert performer, Chapin has ated on Broadway, as well as working extensively in television, radio, and films. An activist songwriter from a legendary musical family, Chapin serves up a tasty mix of story songs, ballads, comedic & political songs, old-time folk classics, and a favorite song or two of his late brother Harry Chapin. 6:30 PM Doors Open, 8:00 PM Show Time. Tickets are $33 and $42 reserved. For info or tickets, call 583-2000 or 800-745-3000 or visit www.bethelwoods center.org. Sunday, September 14 Harvest Festival: FarmFest, at Bethel Woods Market Sheds, from 11 a.m. to 4 p.m. Event is free, $2 parking. The festival features a farmers market, craft village, live performances, corn and hay mazes, pony rides and more. Each week offers a new theme or special event sure to please the entire family. For info, call 583-2000 or 800-745-3000 or visit www.bethelwoods center.org. YOUR LOCAL SOURCE FOR COMPETITIVELY PRICED TELEVISIONS!